I had planned to write something else here but that post can be saved until after the New Year. Instead I thought I would write about a Netflix production to balance against the feelings BRIGHT left me with. I'm here to tell you about a series I watched off of a whim and I ended up really being happy with that decision. ERASED was a good, short series. Here's a little background- ERASED is based on a manga series created by Kei Sanbe that ran from 2012 until 2016. I had seen some pages from this manga before but didn't really pay much attention to it and my interests in manga wasn't and still isn't as high as it should be, unlike other members of this blog group. So, I didn't pay much attention to it nor the 2016 anime series. Additionally, the series is about time travel and anyone who knows me I don't really like time travel stories. Let me rephrase that- I HATE time travel stories. They usually become a confusing mess, particularly if you apply logic, and require alternate timelines that they usually don't address(I know this is funny since I LOVE Legends of Tomorrow but it's true). 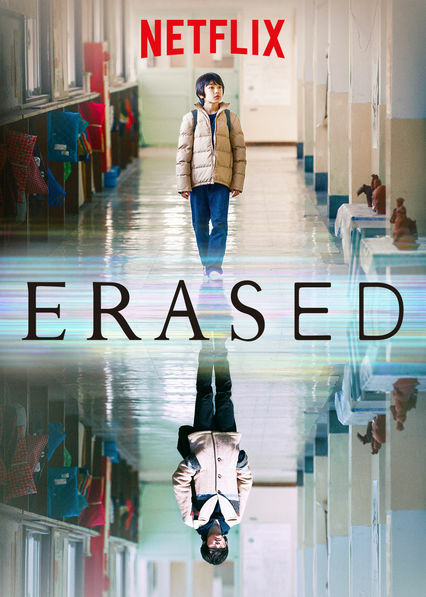 I only gave the Netflix live-action adaptation of ERASED a shot for three reasons- 1) the episodes are only a half hour long, 2) the whole series is only twelve episodes and 3) it was recommended as having a good plot and interesting characters by this YouTube reaction couple I follow. 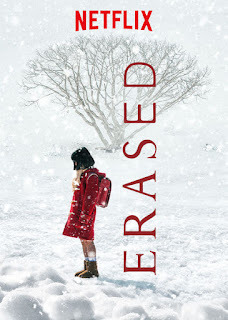 I had some time late one night and couldn't sleep so ERASED got it's shot. Time is on his side. Sometimes. The premise of the show is that there is a guy in his late 20s named Satoru Fujinuma who dreams of being a manga creator but is working as a pizza delivery man. He possesses an ability called Revival which allows him to jump back in time before a life ending incident occurs to someone so he can fix it. These time jumps are usually only about 5- 10 minutes into the past. Satoru's latest intervention caused him to be injured and his journalist mother to move in to help him. This results in his mother being murdered by someone she spots as a serial kidnapper and child murderer and Satoru being framed for his mother's death. This trigger a large time jump of around 18 years into Satoru's past to save his mother and other victims of this criminal. The series mostly follow a 10 year old Satoru on his mission to protected the children he once knew and change the timeline to save many people. This series is filled with heartwarming moments, violence that angers you and scenes that flamed my inner desire for justice. There are twists and turns and at least two timelines of events but it all makes sense. The series is subtitled and since it is a joint production between Netflix and Japan's Kansai TV, the location shots and acting feels authentic and not just a watered down American version of a foreign story. I recommend carving out some time to watch this series. The series had me thinking about the concept of time, choices I have made personally and the relationships and friendships we all create or destroy. 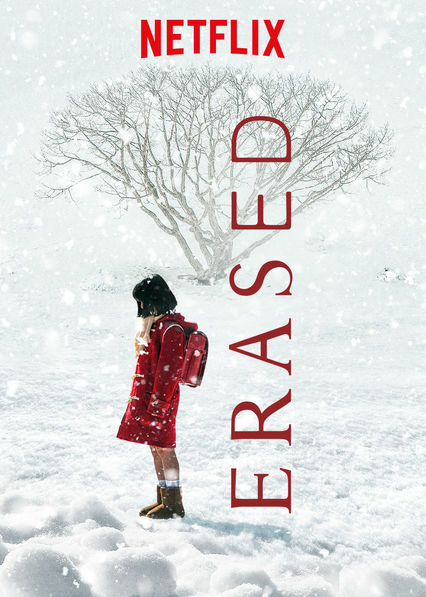 ERASED is enjoyable and at times very tension filled but ultimately you end up feeling hopeful and positive.